Our fathers seemed so big to us when we were children, didn’t they? Whether they were short and stout or tall and thin or somewhere in between, they loomed large in our lives. They might have been the source of love, correction, understanding, or our desire to rebel. No matter–they were big to us, especially when we were little, and often remained so, even after we were all grown up. Spider’s father is no different. He looms large indeed. When Spider is young, he looms physically. And when Spider becomes an adult, he looms psychologically. While the film Spider shows us quite clearly Spider’s “mom” issues, he also has major “dad” issues. The problem with adult Spider is that he not only has infected memories–he is also re-writing his memories in a little notebook every day. So which mother and which father in his memories is real? As Gabriel Byrne and director David Cronenberg have both observed, an abstract idea cannot be filmed or photographed. Playing the figment of someone’s imagination is not easy, especially when one is also attempting to play a real version of the character at the same time. So, while Ralph Fiennes, who is the centerpiece of this psychological drama, has the difficult and demanding role of the adult Spider, he does not have to play the Boy Spider (Bradley Hall does this splendidly). Miranda Richardson plays three roles in Spider’s real life and his imagination–his mother, the prostitute Yvonne, and the care-taker Mrs. Wilkinson, who is really Yvonne in disguise–but they are all actually different characters. 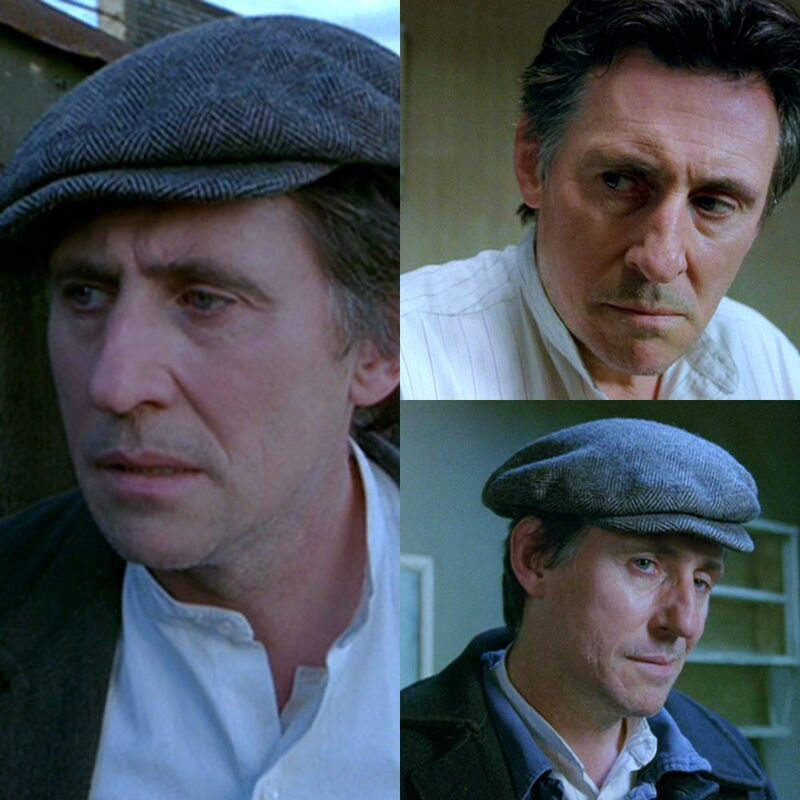 Only Gabriel Byrne is faced with the challenge of playing Spider’s one and only father throughout the film–his possibly real father, his infected memory father, the demonic/imagined father, and sometimes something of all three at once. The intriguing thing about Mr. Byrne’s performance is that he actually does play different versions of Spider’s dad and you can tell them apart quite easily. As the possibly real father, Gabriel plays Bill Cleg as smaller, slighter, quieter, with a troubled expression and mournful eyes. As the infected memory father, he is angry, terse, distant, quick in his movements, scowling. And as the demonic/imagined father, he is big–heavier, broader in his gestures, swaggering, sometimes cartoonish in his expressions, and sexually hungry. In a big way. One father. Lots of aspects. Which are real? Which are figments? Mr. Byrne plays them all, a man walking a tightrope between the abstract and the real. And he never falters. Your patience with this film will be rewarded. You will eventually begin to connect Spider’s memories of these different versions of his father and his mother and you will realize that much of what he is “remembering” is a way to keep from remembering what really happened and what he really feels about it. Here is the interesting thing, though: if you think of Spider as “sick,” then you can walk away from the film with an easy mind. But if you recognize Spider as someone we all could be, then the film will stay with you for a long time. You may find yourself re-watching it now and again, listening to David Cronenberg’s insightful and rewarding commentary, and understanding the connections and layers in this “expressionistic” film in different ways. There are not many films that would bear this kind of scrutiny. Spider is one. The Spider Mega Movie Page offers you lots of promotional stills and screencaps (made by yours truly for once! ), video (including a very good video critique of the film), reviews, excerpts from the DVD Extras, and more. If you have seen the film, this will be a walk down memory lane. But beware your memories! If you have not seen Spider yet, perhaps this mega movie page will entice you to enter its dark and complex web. Either way, enjoy! Ohh I must watch this.